Gretchen McNeil, author of young adult horror novels POSSESS, 3:59, RELIE and TEN introduces an innovative take on teen apocalyptic carnage with #MURDERTRENDING. When Dee Guerrera, a normal 17-year-old, is convicted unjustly for the murder of her step-sister, Monica, she finds herself thrown into Alcatraz 2.0, a repurposed island in the middle of the San Francisco Bay. However, this new version of Alcatraz in the United States’ near-distant future is not a normal prison. Instead, the former reality star president of the United States has granted control of the criminal justice system to the Postman, a mysterious figure who hopes to entertain the public while profiting off of convicted killers. "#MURDERTRENDING creatively and originally tackles a world of teen killers in an electrifying but often graphic style, appealing to readers who enjoy suspense and horror novels." After her unfair conviction, Dee must survive inside a world of prison suburbia that is always filmed for a live streaming app. While the entire United States watches convicted murderers receive so-called justice carried out by the elusive Postman and his hand-selected executioners, Dee must fight to prove her innocence and find Monica’s real killer. Along the way, Dee meets Griselda, her new beautiful and scary coworker; Nyles, a handsome British prisoner with diplomatic immunity; Ethan, a gym rat pretending to date Griselda; and Mara, Dee’s elusive next door neighbor. Dee quickly finds herself depending on her new posse to survive and uncover the truth, who app users brand the Death Row Breakfast Club. 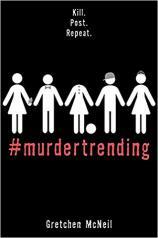 #MURDERTRENDING creatively and originally tackles a world of teen killers in an electrifying but often graphic style, appealing to readers who enjoy suspense and horror novels. McNeil casually pokes fun at the similarities of her own novel to that of other famous dystopian teen novels, sardonically referencing THE HUNGER GAMES and the U.S.’s addiction to reality television. The novel also carefully examines the dangers of desensitizing young people to violence, as the always live streaming, government approved app infiltrates the consciousness of U.S. citizens. As a protagonist, Dee herself is likeable and relatable as she attempts to survive in her dangerous new world. Readers can easily root for her and relate to her average athleticism, as she fits into the role the Postman has prescribed her as a battle-ready Disney princess. McNeil carefully executes the layout of the mystery, using flashbacks to explain Dee’s hidden past. The flashbacks add an interesting layer to Dee’s character, even as they sometimes jar the reader from the present day action in the plot. Although an exciting and thrilling read, potential readers should be warned that the novel is gory. 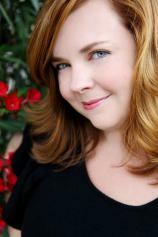 McNeil’s past in writing horror novels is clear --- as each murder occurs, she painstakingly details each moment. In all, McNeil crafts a thoroughly satisfying mystery with a conclusion that will keep readers who enjoy thrillers on their toes.